Bear Trap Dunes vacation rentalhouse near Bethany Beach Delaware from Bethany Beach Home Rentals. 2/47: Huge Screened in Porch w Panoramic Golf Course Views. Gas Grill. 6/47: Bedroom 2 with Queen Bed. 20/47: Fun zone for kids including bicycles for use. Extra frig also included in rental. 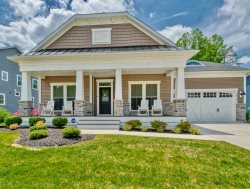 When You Vacation at This 1 Level Resort Home at Bear Trap Dunes Resort, You'll be Vacationing With Style! Enjoy Panoramic Golf Course Views From Your Family Room, Dining Room, Gourmet Kitchen. Great Location That is Walking Distance to all of the Bear Trap Amenities. Extra Large Great Room with Soaring Ceilings Provides a Open and Soothing Feeling of Relaxation. Fully Stocked Kitchen features New Stainless Steel Appliances, a huge 12 ft island, dining room table, breakfast nook table. Seating for 12. Equipped with griddles, pots, pans, blender, Keurig coffee maker, waffle maker, panini maker, crock pot, dishes, bowls, silverware, gas stove, convection oven, dishwasher, disposal, garbage bags, dishwasher pods and more. Enjoy Iridescent Sunrises From Your Oversized screened in Porch Meals While Looking Out Over Bear Trap Dunes Award-Winning Golf Courses. (3 Courses on Site - The Kodiak, The Black Bear and The Grizzly). Sun deck features a gas grill. Front covered porch as well. Master ensuite with soaking tub, separate shower, double vanity and walk in closet. Four Bedrooms Altogether with 2 and a half bathrooms. Sleeps 10. * Watch cable HDTVs from every bedroom and family room. * Unlimited Free HIGH SPEED WIRELESS INTERNET. Just 3 miles to Bethany Beach. Take the Bear Trap Dunes beach shuttle which runs from the resort to Bethany Beach and back, from morning to early evening, 7 days per week from Memorial Day weekend to Labor Day. Bear Trap Dunes resort: features Golf Course views, neighborhood charm & relaxing small town feel with the best resort amenities in the area including 3 pools (one indoor Olympic sized pool), tennis, private beach shuttle, fitness gym, sauna & whirlpool and much more. Golf: Bear Trap Dunes 3 golf courses are rated 4 stars by Golf Digest Magazine. Tax free Delaware shopping! boardwalks, entertainment, water sports, fishing & restaurants to fit every taste. Beautiful house and wonderful community. Many amenities and only a short drive to the beach. My daughter and I woke up in the morning and rode bikes to the fitness center which was very nice. The house had everything we needed. Beach chairs, Umbrella, boogie boards, bikes etc. this is a wonderful place to stay for the price. We stayed in Fenwick Island two years ago and payed a lot more and the house wasnt as nice as this one. Every morning our family had breakfast on the screened in patio and would watch the golfers go by. It was a great week. 5 star house. Linen Notes: We will provide mattress pads, pillows, blankets and comforters and our guests will bring along their own sheets, pillow cases and towels. You will have a washer and dryer in your home that you are welcome to use. You may also rent sheets, pillow cases and towels nearby from Gale Force Rentals located just a couple of miles away. They will also deliver directly to your vacation home for you. RECREATIONAL PASSES are required to use the resort amenities such as the indoor and outdoor pools, beach shuttle, hot tub / Jacuzzi, tennis, saunas, fitness gym, basketball, volleyball, ping pong, etc - everything except golf which is completely separate). NOTE: You aren't required to purchase any passes if you don't want to - purchase passes only for those who'll be using the amenities at the same time. NOTE: YOU CAN SHARE PASSES so it would be wise to purchase passes based on the MAXIMUM number of people in your group who'll be using the resort amenities AT THE SAME TIME. Also, Children under 4 years old don't need a pass - they just need to be with an adult. Passes cost between $20- $40 depending on the time of the year - the passes are good for up to 7 nights. You purchase the passes at the resort pavilion after you arrive by making a check or paying cash to the HOA. * STRICT NO PETS HOME. Not adhering to the House Rules may result in immediate cancellation of the reservation without refund.